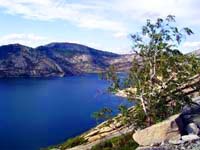 Here, travelers can enjoy the scenery of five lakes, go trekking, and swim from June to August. On the opposite (difficult to access) lakeshore there is a nudist beach, available for foreigners to spend time "in natural surroundings". Several bodies of water are contained within a large geological rift. A nameless stream, flowing into into the Sibinka River, flows through all the lakes. The total area of the five lakes' area amounts to 31 square kilometers. 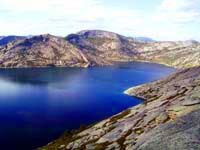 The lakes are surrounded by a low mountainous landscape: small granite peaks covered with sparse pine forests and fescue and feather grass, together with shrubs and rambling meadows on mountain chestnut soils. 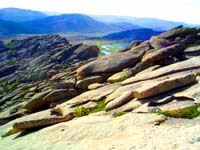 The erosion and structural peculiarities of granite, which forms the territory, is inclined to weathering into round shapes making the valleys into galleries of strange formations. 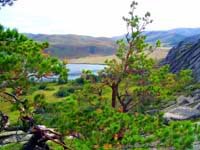 The valley of the lakes is enclosed on three sides, and open to the southeast, where the lakes are gently uplifted by the slopes of the Ablaykitskiy ridges, overgrown with steppe and meadow vegetation. The hollows of the lakes are divided by narrow, serrated and sometimes flat ridges, almost devoid of vegetation. In some places one can see eroded wells, often overgrown with ordinary and rare plants: sedges (Carex L), cereals (Gramineae juss), pondweeds (Potamogenon L), duckweeds (Lemna L), tape-grass (Vfllisneria L), cotton-grass (Eriophorum L), and mosses ( Bryophyta). Aquatic vegetation is represented by over 30 species, some of which are ancient natives of the area: pondweed pectinate (Potamogeton pectinatis), perfoliate (Potamogeton obtusifolis)/(Potamogeton lucens L), marine nais (Najas marina), Ceratophyllum (Ceraatophyllum L), bladderwort (Utricularis L), minor duckweed ( Lemna minor L)/(Lemnf trisulca L), yellow spatterdock (Nuphar luteum), Sagittaria (Sagittaria L), amphibious knotweed (Poligonum amphibium), etc. Rare vegetation is represented by the tetragonal water lily (Nymphaea tetragona), the population of which is endangered (previously, this species could be observed in all the lakes, now it exists only in the Dyujsen and Istykpa lakes). Riparian vegetation is consists of the tule lacustrine (Scirpus lacustris), ordinary reed (Phragmites cjmmunis ), broad-leaved reed mace (Typha katifolia L) and narrow-leaved (Typha angustifolia L), sedges (Carex L), cereals (Gramineae juss), etc. Additionally, lakes are rich in algae - filiform, diatom (Diatomophyta), green (Chlorophyta). The bottom of the lakes is mostly covered by (Charophyta). All of these make up the food chain for water birds and fish. Vegetation in the surrounding area is represented mostly by xerophyte species. Various species of grasses prevail here: pinnate feather-grass (Stipa capillata), fowl-grass (poa trivialis), timothy-grass (Phleum phleoides), and sedge (Carex supina). By-species include: burnet (Sanguisorba officinalis) , scabious daffodil (Scabiosa ochraleuca L), (Sossurea amara), five-finger Norwegian (Hotentilla norvegica L), milfoil (Achillium milifolium), Berteroa incana (Berteroa incana), globe-thistle (Echinops ritro L), major buckhorn plantain (Plantago major/lanceolate (Plantago lanceolata), and geranium albiflorium (Geranium albiflorium). Dog-rose shrubs can be seen (Rosa cinnamomea L) and (Rosa acicularis), as well as (Salix caprea L). The following fish are found in the lakes: perch, carp, and pike. Nearly all accessible lakeside areas have been developed with recreation centers and private homes. The northern shore is very picturesque, with splendid beaches, accessible only by water or over the mountains. It enjoys wide popularity among visitors and locals alike. According to an unwritten law, guests maintain order in this place. The climate of lake is extreme continental. Annual rainfall amounts to about 300 mm per year, including 150 mm during July and August. Average wind speeds are 2-3 m/s; sunlight exposure is 2500-2600 hours per year. Average annual temperature in January - 16°, and in July +19° С. The frost-free period lasts 210 days. Such climatic characteristics, surrounding granite mountains with pine forests and steppe grasses, as well as the availability of five large beautiful clean freshwater lakes make this territory one of the most popular places in the area, and a favorite of local residents for summer recreation. A national park was proposed to be created there, but unfortunately the plan was never implemented. The site is located 85 km from Ust-Kamenogorsk - 2 hours' journey on paved roads. During the trip, visitors will remark the picturesque hilly landscape punctuated by granite massifs.